Introduces the visitor to Philo T. Farnsworth, who at the age of 14 came up with the idea of electronic TV, the type we use today. 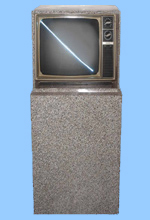 This exhibit has one of a kind cathode ray tube which let the visitor see images through the back of the tube. Using this exhibit visitors observe how magnets can move and electronic beam. Using the yolk, visitor can rotate the image, or play with the electronic beam itself.